Raised bed gardening is the latest thing when it comes to growing vegetables. With the advent of this type of gardening, more and more people are growing vegetables. There are many reasons that gardeners prefer growing vegetables in raised beds. First, raised beds allow you to choose the type of soil in your gardening area. The soil in these beds does not become compacted because the beds are never walked on. Because the soil is not compacted, the beds can drain excess water easily. Additionally, the soil in raised beds warms up quickly, which gives you a longer growing season. Raised beds can be used to grow a variety of vegetables; however, several veggies do especially well in raised beds. Let's check out the top five vegetables to grow in raised beds. Root vegetables like beets, carrots, parsnips and radishes especially love raised beds. Raised beds do not contain rocks and the soil is loose which allows these root vegetables to spread out and really flourish. By having complete control over the type of soil in the bed, you can grow amazing root vegetables. Raised beds allow you to create the perfect environment for root vegetables without any rock or clay –it’s one of the reasons why you should garden with raised beds. Rock, clay and other debris can cause misshapen vegetables and reduce the size of your harvest. Green leafy vegetables like kale, lettuce and spinach prefer raised beds because the soil is well-drained, nutrient-dense and warm up quickly in the early spring. You should plant these cool weather crops as soon as the soil begins to warm. In fact, because the soil in raised beds warms so quickly, you can plant leafy green vegetables early, allowing you to harvest several times before summer hits. Additionally, because the soil in a raised bed drains so well, you can grow amazing leafy green vegetables without worry of root rot. Onions love raised beds for three different reasons. First, onions prefer quick draining soil. They also require plenty of organic material and a long growing season. Because you choose the soil, you can create the perfect soil for onions by adding plenty of compost to your soil mixture. Additionally, if you decide to grow onions from seed, it will take more than 100 days for your onions to reach maturity. The soil in a raised bed warms up much much quicker than the ground, which allows you to plant your onions early. Finally, the soil in a raised bed does not contain any items which can misshapen your onions or prevent them from reaching their full potential. Tomatoes require nutrient-dense soil and regular feeding and watering. Adding extra compost or top soil with fertilizer will ensure that your tomato plants receive the nutrients they need to produce beautiful fruit. Because the soil is loose in a raised bed, it can be more difficult for your stakes or tomato cages to stand upright, so you may need to plan on how you will support your tomatoes. Many gardeners find that attaching a wooden tomato stake to the exterior of the box and running twine between the stakes is the easiest way to keep your tomato plants upright and properly supported throughout the growing season. You not only get a larger crop of potatoes in a raised bed but raised beds also make harvesting much easier. As soon as the potato shoots begin to grow, they need to be hilled. In a raised bed, it is quite easy to hill your potatoes. Potatoes need loamy loose soil that drains well. Additionally, potatoes do best when they can spread out in the soil. The loose soil allows the potatoes room to grow and drains well to prevent your potatoes from rotting. Raised beds tend to produce higher yields and larger tubers. Whether you enjoy white potatoes or sweet potatoes, a raised bed will produce an amazing crop. Raised beds can be used to grow any vegetable; however, the five listed above grow especially well in a raised bed. 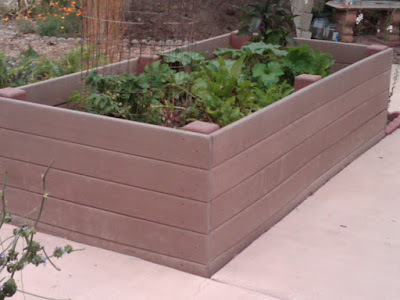 Raised beds allow you to develop a green thumb and enjoy delicious vegetables throughout the growing season.